Today Tony Gallopin and Andrew Talanski demonstrated what determination, stubborness and dependence only upon the self can achieve in sport. They did not let themselves down. Two of the more memorable scenes in the Tour de France occurred today on Stage 11. The first was when Tony Gallopin crossed the line just ahead of a stampeding sprint. The second was when Andrew Talansky, refusing to give up the fight, crossed the finish line with the grim reaper of the voiture balai on his tail. These triumphant moments helped erase the melancholy of the past days when it seemed quite unfair to witness good men being removed unwillingly from competition. What a stark contrast to see Tony and Andrew give their all, compared to Fabian Cancellara's quitting the race yesterday to prepare for the future. Nothing about Tony and Andrew's effort today was safe or meek, they each won in their own way by not giving up. One happened to be first in the race, one happened to be last. Tony Gallopin, after attacking 4.5km from the finish line, was reeled back in by three other riders attacking off the front of the peloton. 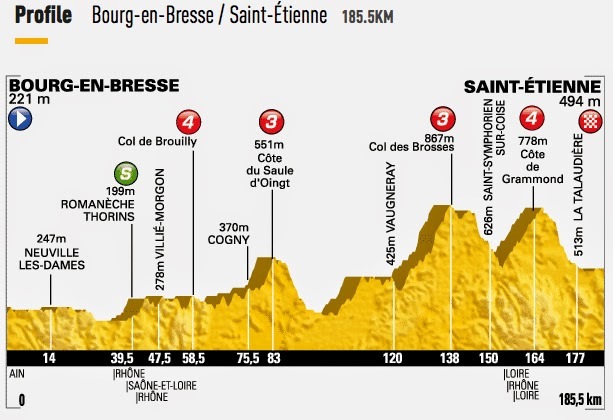 Gallopin tried again at 2.5km, this time he released their grip, daringly descending and cornering through town to fight for the final meters and reach the finish line just ahead of a sprinting pack of 35 riders. Andrew Talanksy lost contact with the peloton at 80km out. He sat on the road for over 4-minutes trying to make a tough decision. In the end (and I do mean the end) he decided to carry on to finish the stage alone with a team car as a companion and the voiture balai (broom wagon) looming close behind. He crossed the line at 32'05", just making the official time cut-off of 34'33". Andrew Talansky makes the cut-off time into Oyonnax, 32'05" behind Tony Gallopin. This was exactly the sort of suffering triumphant drama that the French love so much about the Tour de France. Don't we all, Stage 11 was memorable and rejuvenating.